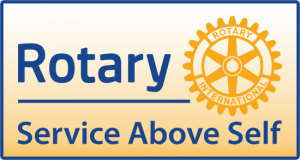 If you are interested in knowing more about Rotary and what we do in the community and beyond please join us for lunch, (RSVP if you are coming) help at one of our projects or contact any of our officers or directors listed. Annual Surf & Turf Dinner Auction 2019 was a success. 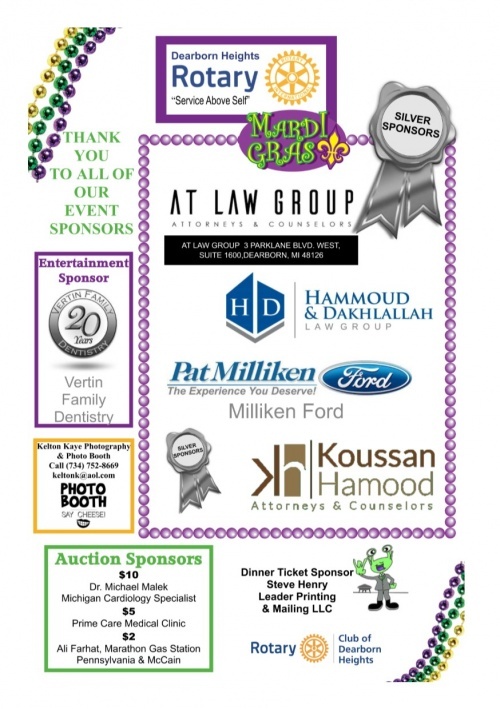 Thank you so much to all who attended, our sponsors (Pat Milliken Ford, AT Law Group, Hammoud, Dakhlallah & Associates, Koussan Hamood PLC, Vertin Family Dentistry, Leader Printing and Mailing, LLC, Kelton Kaye, Dr. Michael Malek Michigan Cardiology Specialist, Prime Care Medical Clinic, Ali Farhat, Marathon Gas Station), donors, volunteer helpers and guests we couldn't do this without all of you. The Joy Manor staff did a tremendous job - thanks. To all of you - is was a good time, to us it was support to continue our projects. "It's not about the money, it's about what the money can do"®️ Want more info about Rotary? Contact one of our members or attend one of our meetings. Serving our community since 1964. What's that line? If you build it they will come? Well we built bookcases and the children came to get them at our Annual Bookcase and Books for Kids Project Lunch. #peopleofaction That's Rotary! The Rotary Club of Dearborn Heights hosted a public event at Roasting Plant Coffee for World Polio Day. 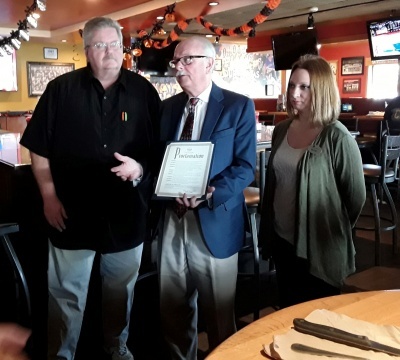 Mayor Dan Paletko stopped by to present a proclamation to club president, Wendy Fichter declaring October 24th. World Polio Day in Dearborn Heights. 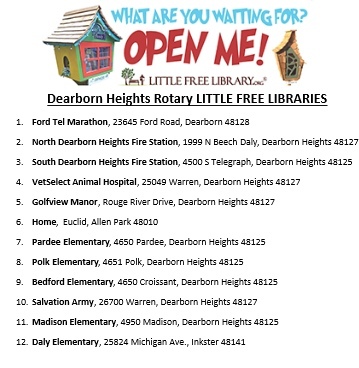 THANK YOU to all the runners, walkers, volunteers, sponsors and donors who helped make this event happen so The Rotary Club of Dearborn Heights can continue to give back to the community with our many projects like Little Free Libraries, Bike Safety Rodeo, Bookcase & Books for Kids, Scholarships and so much more. A Surf & Turf Dinner themed Polynesian Paradise on Saturday, April 14, 2018. 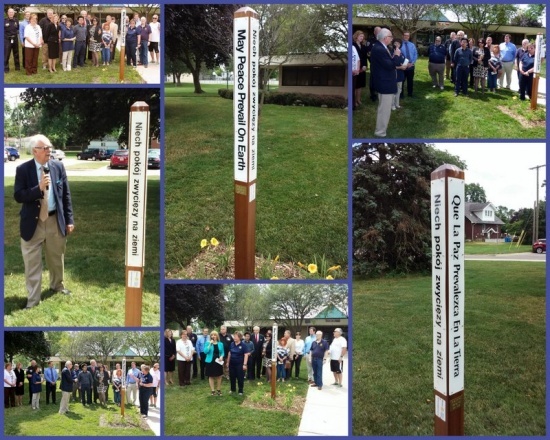 Mayor Paletko dedicated The Rotary Club of Dearborn Heights Peace Pole to the Dearborn Heights City Hall and the Dearborn Heights, Michigan residents on June 21, 2017. *A Peace Pole is a hand-crafted monument that displays the message and prayer "May Peace Prevail on Earth" on each of its four sides, in different languages: English, Polish, Arabic, Spanish and also Braille. There are tens of thousands of Peace Poles in 180 countries all over the world dedicated as monuments to peace. Promoting Peace is one of the six major areas of focus for Rotary members. Area Children came out for a fun time to learn bike safety, receive a free bike helmet, Child ID video, have a hot dog lunch, explore the Police and Fire vehicles for our annual Bike Safety Rodeo. This is our annual student Job Shadow Lunch. The students join us for lunch and briefly tell us about their morning experiences after visiting area businesses. Heights Watershed Stewards with spring clean up along Ecorse Creek near the Richard A. Young Recreation Center. 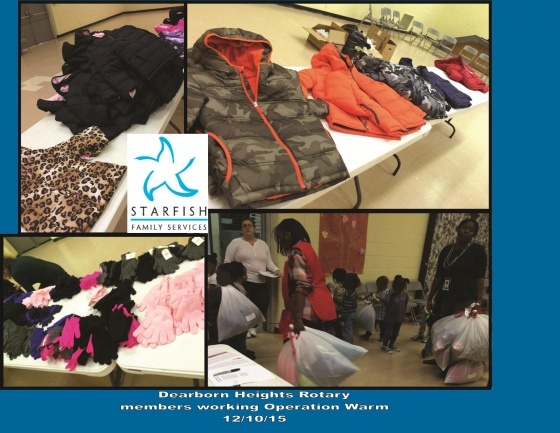 When you shop on Amazon and choose Dearborn Heights Rotary as your favorite charity you help students receive scholarships. 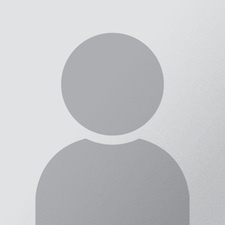 Use the link on the left. This is the first stage of our Bookcase Project organized by project chairperson, Claude Curry. The 2017-19 Peace Scholar Information and Applications are now available. 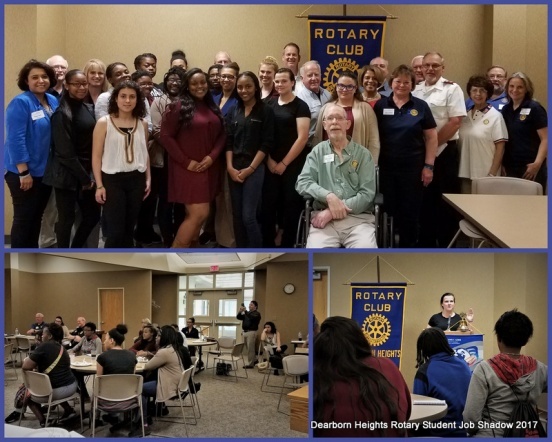 If you are interested please contact the Club President or any of the members of Dearborn Heights Rotary Club for more information and the application so that we may sponsor you.This is a Masters Degree Program that is sponsored by The Rotary Foundation. Want an idea of what we do? 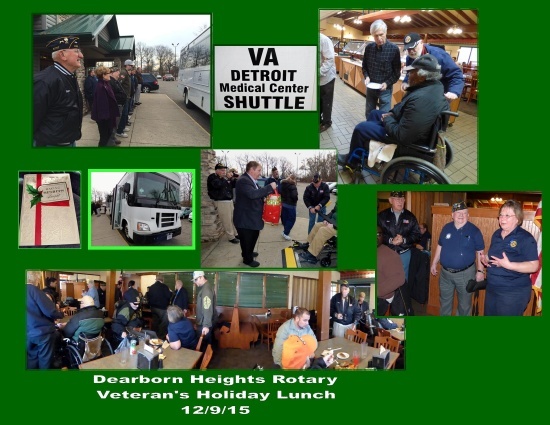 The Veteran's Holiday Lunch was a very heartwarming event. Rotary brings together community leaders from all continents, cultures, and occupations to share their ideas for making the world a better place. By combining their distinct skills and expertise, Rotary members are tackling some of the world's most pressing problems – from local initiatives like feeding the hungry to global efforts like eradicating polio. Rotary is a community of friends who are committed to creating positive change in the world. Find out how joining your local club can enrich your life and improve the lives of people living in your neighborhood and across the globe. We invite you to find out more of what our club does by searching the many links on this site, visiting one of our weekly meetings or contacting any of our members.